Browse our complete inventory for genuine Canon ink cartridges at low prices. 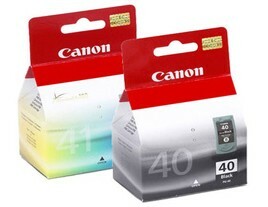 Easier and more reliable than refilling old cartridges, Inkcolour's genuine Canon PG-40 and CL-41 ink cartridges feature Canon chips so the printer recognizes them as new. Full-size Canon 0615B036AA ink tanks, one each in black and colour, are capable of printing up to 320 colour pages or 490 pages of black and white copy. Genuine Canon replacement cartridges are easy to install, and your printer's alignment function takes the guesswork out of colour balancing. Get hundreds of sharp, clear images and documents that are resistant to smears and smudging.